This is the first very interesting add-on for MCPE 1.0.4/1.0.5. 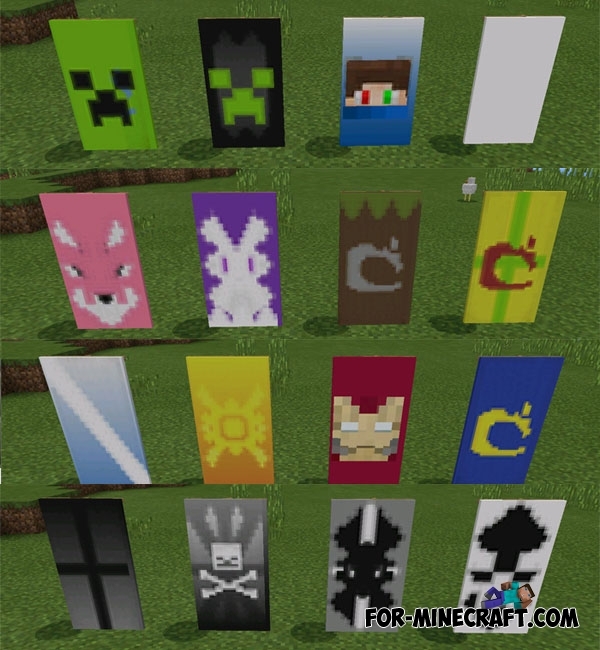 With it the game will get 16 banners with different patterns taken from Minecraft PC. Banners can be used as decoration, some players put them close to walls instead of wallpaper. But this addon has disadvantages: there are 16 ready-made options for banners, the player can not create your own patterns. Take a Shulker egg and spawn it. Then select any dye, and tap a blank banner. The pattern depends on the dye, so try all one after the other dyes. All the patterns you can see below. Banners can be added to Minecraft PE 1.1.0, more info here. But while you can easily download this addon and get a nice banner for a few seconds. In addition, you can support the creator, by subscribing to his twitter. How to make custom banners? Watch this short video which shows the process of creating your unique banner in MC:PE. All you need: a few minutes and any image editor. So you can create your own logo or icon and attached to castles, towers, or anywhere you want. But custom banners are only visible to those players who have installed addon, so if you want to play with friends with this addon, then send them your archive or a link to this file. How to install the Banner Addon? Installation in 1.0.4 is no different from previous versions. 1. Start the game and go to the world settings. 2. Activate the resource and the behavior pack.